"The mundus is really a mouth of hell, a way of communication between the upper earth, the abode of the living, and the subterranean world, the dwelling of the dead." As I said before, chapter 12 of the Liber Linteus shows a case alternation between muθ hilarθ une (with locative un-e) and muθ hilarθ una (with commitative un-a). Cross-correlating the context of each of these words with other Etruscan inscriptions, I read "The mundus (muθ) is enclosed (hilarθ) with libation (une/una)." The slight variation in case of the last word must nonetheless convey the same thing, much like the creative case choices seen in the main religious formula of the Liber Linteus that likewise suggest only nuanced semantic differences if any despite different case endings. The phrase mut-ti ceśasi in LL 10 refers then to depositing (ceśasi) a holy offering 'in the pit' (mut-ti). Additionally, considering that Indo-Europeanists haven't identified a native source for Latin mundus, it may very well be loaned from Etruscan muθ. Afterall, a large portion of Roman religious rites has already been attributed to the Etruscans before them whose traditions are simultaneously linked to similar rites like those of the influential Hittites of yore. This further contributes to the plausibility of interpreting muθ as a ritual pit. Given the existence of this important Etruscan word, and charging forward with my previous identification of a Minoan accusative-declined noun phrase on libation table KN Za 10, tan muti Asásaramana 'the pit of Asasarama' (as per John Younger's transliteration), a common Proto-Aegean word *muti meaning 'pit, hole' is a natural sequitur. The reduction of final vowel and concommitant aspiration of plosive in Etruscan is already explained by Cyprian Syncope. Finally there's the matter of what kind of goddess Asásarama would have represented to the Minoans. I get the impression of an archetypal fertility and earth goddess paralleling Isis and Ashtarte. If we follow the recurring themes of the religions hugging the eastern Mediterranean during the 2nd mill. BCE, this would lead me to suspect that she was also the wife of a local god of storm and/or underworld, like Egyptian Osiris or Hattic Wurun-Katte. If a fertile earth goddess, the link between Asásarama and a word 'pit', already noted as a chthonian symbolism in Hittite rites, is all the more promising. I plan on elaborating more on the nature of Asásarama and other possible intercultural connections in a future post. Could this word be a Semitic borrowing, *mwt "to die"? You must have noticed the two entries for muθ in my Etruscan dictionary, one meaning 'to die' (base of mutana 'sarcophagus, coffin') and the other meaning 'pit' (as used in the Liber Linteus). So either we're dealing with one root or two homophones. Assuming one root (the optimal choice), either Semitic *mawātu 'to die' or Egyptian *māwat (written mt or mwt) may be considered the likeliest source. Then the Liber Linteus phrase muθ hilarθ une "the mundus (muθ) is enclosed with libation" might be read literally as "Death (muθ) is enclosed with libation" where "Death" is a metaphor for the ritual pit. 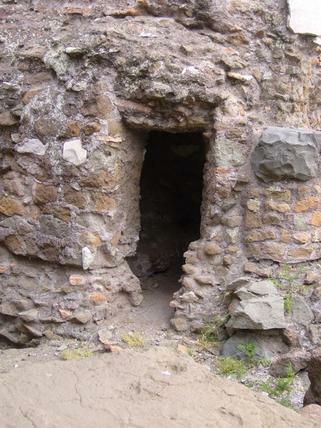 It's as if to suggest that opening the pit was believed to be symbolically like opening up the "gates of hell" in order to communicate with and serve one's holy deceased ancestors who are thought of as personalized guardian angels (as long as you continue to "feed" them, that is, otherwise your ancestors might get pissed off and haunt you). I should add that I've been contemplating the possibility of two separate roots, one meaning 'death' (an Afro-Asiatic loan as above) and the other meaning 'mouth' (a presumably native word). If so, a word association between 'pit' (as a kind of 'mouth' of the earth) and 'death' might be a secondary development within Italy. There's a lot to consider and I need to peruse my database at home again to pursue some ideas. Hmm...there's the PIE root (or at least European root) *mnt "mouth". The Greek reflex, mathuiai, has an unexpected aspirate. It would be nice if Latin mundus could be derived from that root, but I see no convincing way to do that. Well, I'm a skeptic about (*)*mnt-. This is poorly attested and has an odd form (ie. zerograde??). By comparison, there is the typical root in PIE for 'mouth', *ʔoxs (*h₁oh₂s). This has all the quackings of a relatively recent loan rather than an old body term. The supposed PIE origins of Germanic *munθaz 'mouth' are not above debate.